Coccidiosis is an intestinal tract infection caused by a one-celled organism or protozoa called coccidia. In cats and dogs, most coccidia are of the genus called Isospora. Isospora felis and Isospora rivolta are the most common species of coccidia found in cats. Coccidia are not parasitic intestinal worms. They are microscopic parasites that live within cells of the intestinal lining. Because they live in the intestinal tract and commonly cause diarrhea, they are often confused with worms. How did my cat become infected with coccidia? "A cat may become infected by eating the infected mouse." 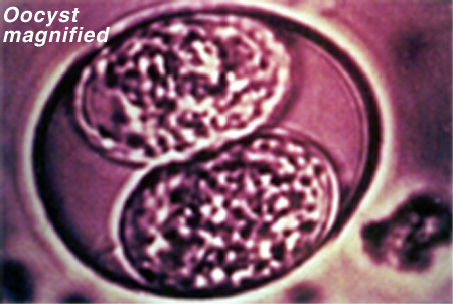 Oocysts or immature coccidia are passed in the stool of an infected cat. They lie in the environment and eventually sporulate and mature into a more developed oocyst that can re-infect the cat. Other cats, dogs, or mice may also become infected. This process can occur in as little as six hours, but it usually takes seven to ten days. If the sporulated oocysts are swallowed, they mature in the cat's intestine to complete the life cycle. If a mouse should swallow the oocysts, a cat may become infected by eating the infected mouse. Kittens are commonly diagnosed with coccidiosis. A kitten is not born with coccidia. After birth, kittens are frequently exposed to the mother's feces. If the mother is shedding the infective cysts in her feces, her babies can ingest them during nursing. 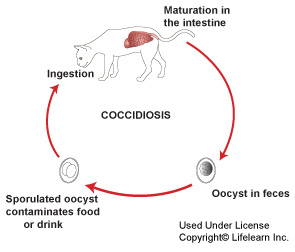 Since young kittens(less than six months of age) have no immunity to coccidia, the organisms reproduce in great numbers and may cause serious consequences. It takes about thirteen days for illness to develop after the kitten first ingests coccidia. Consequently, kittens that become sick from a coccidial infection are at least two weeks old. Although most cases are the result of infection from the mother, this is not always the case. Any infected kitten or puppy is contagious to other kittens or puppies. In breeding facilities, animal shelters, kennels, and other areas where numerous pets may come into close proximity with one another, it is wise to isolate infected animals from those that are not. What are the clinical signs of coccidiosis? "In kittens and debilitated adult cats, coccidiosis may cause severe, watery diarrhea, dehydration, abdominal distress, and vomiting." Most cats that are infected with coccidia do not have diarrhea or any other clinical signs. When the eggs or oocysts are found in the stool of a cat without diarrhea, they are generally considered a transient, insignificant finding. However, in kittens and debilitated adult cats, coccidiosis may cause severe, watery diarrhea, dehydration, abdominal distress, and vomiting. In severe cases, death may occur. Coccidiosis is diagnosed by performing a microscopic examination of a stool sample. Since the oocysts are much smaller than the eggs of the intestinal worms, a very thorough evaluation must be performed. Infection with some of the less common coccidial parasites may be diagnosed with a special blood test. The most common drug used to treat coccidiosis is a sulfa-class antibiotic. It is typically administered for six to fourteen days. Some formulations of this medication are pleasant-tasting and most cats will readily accept it. If the sulfa drug is not effective, other treatments are available. Additional supportive treatments may be needed if diarrhea and dehydration occur. Cats are frequently re-infected from the environment so disinfection is important. The use of diluted chlorine bleach [one cup (250 ml) of bleach mixed in one gallon (3.8 L) of water] is effective. Be sure to test clean a small area of any affected materials since bleach can damage many surfaces. Can I get coccidiosis from my cat? "The most common species of coccidia found in cats do not infect humans." The most common species of coccidia found in cats do not infect humans. Some of the less common types of coccidia are potentially infectious to humans. One of these less common species, Cryptosporidium, may be transmitted by cats or dogs to people, especially those with compromised immune systems. Cryptosporidiumhas also been found in public water supplies in some major cities. Another coccidial organism, Toxoplasma, is of particular concern to pregnant women because of the potential to cause birth defects in newborns. However, most human cases of Toxoplasmosis occur from eating contaminated meat as opposed to contact with a cat's feces. These two coccidial parasites pose an increased health risk for immunosuppressed humans (i.e. AIDS patients, those taking immune suppressant drugs, cancer patients, etc.). Good hygiene and proper disposal of cat feces are important in minimizing risk of transmission of all feline parasites to humans. Although there is risk of the cat transmitting these two particular parasites to humans, it does not warrant removing the cat from a home except in very rare instances, since transmission can be prevented by practicing good hygiene.